Drawn To. Attracted To. Taken With. You’ll be all three with our 3543F - Bright 14/20 Yellow Gold-Filled 2mm Drawn Flat Cable Chain. “Drawn” chain is round or oval machine links that have been stretched or “drawn” to elongate the chain. “Drawing” a chain can change its overall appearance and also make it narrower. 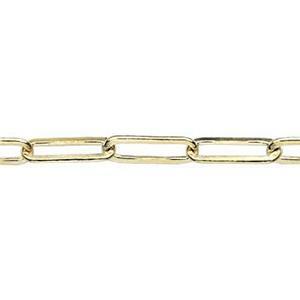 If you love the tapered, narrow look you’ll love this stylish bulk chain for your high-class jewelry designs.